As we remember the 12th anniversary of the terrorist attacks on September, 11, 2001, we will most likely be reminded of countless stories of extreme courage in the face of extreme danger. 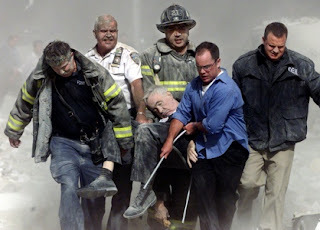 Stories of investment brokers who reenter the twin towers, after they had safety within their grasp, to rescue others; stories of firefighters and police officers giving their own lives so that others could live; stories of ordinary citizens banding together to prevent a plane from reaching its intended destination. As we read or hear more and more of these stories, we encounter some, like that of Todd and Lisa Beamer, that tell of Christian men and women who exemplified this school year's theme verse from Philippians 1:20, "I eagerly expect and hope that I will in no way be ashamed, but will have sufficient courage so that now as always Christ will be exalted in my body, whether by life or by death." There are plenty of warnings to always be spiritually prepared. Some warnings are personal like illness or the loss of someone close to you. Some warnings are evident on a global level such as wars, tornadoes, tsunamis, or earthquakes. Each event, like the first attack on the Twin Towers, should remind us to be prepared for the day when we meet Jesus. So instead of dutifully evacuating a building, how can we prepare spiritually? Celebrate Easter every Sunday with regular worship. Read the Bible. Pray. Like exiting the building, they all seem pretty simple, but they will make all the difference in the end. Dear Lord, thank You for the gift of your son Jesus whose death and resurrection assures us that we will be with You. Help us to be diligent in our preparation as we faithfully worship, study your word and come to You in prayer. In Jesus’ Name, Amen.